A few months ago, I joined a Henderson chapter of Toastmasters International in an effort to hone my public speaking skills and in hopes of making new professional connections. At the initial meetings, I met a cosmetics salesperson, a senior project manager at a national construction company, a holistic healer, and many others. There were two other attorneys. We exchanged pleasantries, business cards, and a few words about our respective businesses. I had gone out on my own earlier this year after five years of working for others to practice personal injury and contract law, and he had been practicing on his own for about seven years (he started his own business straight out of law school), primarily in the areas of bankruptcy, estate planning, and probate. The next week he invited Keith and me to lunch. Our meeting was originally intended to be for networking purposes—establishing new contacts as a potential source and target for referrals. Somehow, though, we all independently came to the conclusion that having Matt join the firm would be a synergistic move that would likely result in a firm better equipped to meet the varying needs of potential clients. Matt always takes the time to ensure his clients fully understand their choices and aligning those with their needs to create an excellent Family or Personal Trust. I highly recommend him and the services he offers to my clients without reservation. I have consulted with Matt on estate planning. I was impressed with his ability to ask the right questions to understand our needs. 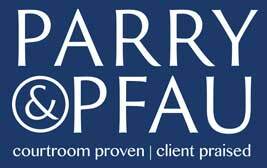 He is thoroughly knowledgeable about not only estate law but the needs of families. Matt is establishing a trust for my wife and I and I’m very glad to be a client of Matt’s. Matt Pfau is a trusted professional to help you and your family through the legalities of a trust and estate planning. You will be treated with the attention and respect you deserve. Matt likewise took some time to vet us, and eventually accepted our offer. Since meeting Matt, we have come to realize that he is a highly competent, energetic attorney who works hard to maintain client relationships through excellence in representation. We are excited to welcome Matt to the firm and to add his name to ours in what we know will be an exciting venture. To read more about Matt, check out his biography here. You can also contact him directly at 702 912 4451, matt@p2lawyers.com, or by stopping in to say hello. Older PostCan I Fire My Attorney?